The trick-or-treat test is amazing. Zillow ruined it. It’s called the trick-or-treat test. It’s brilliant. And Zillow ruined it. 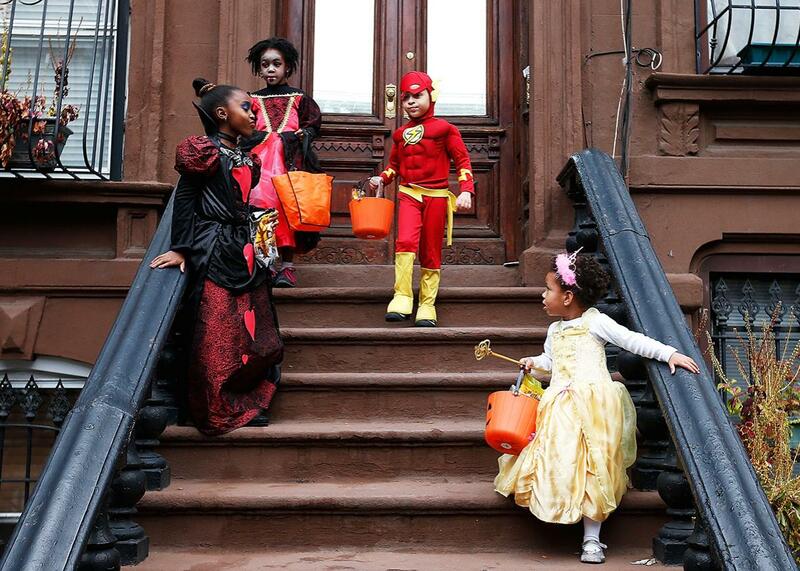 Children trick-or-treat in Brooklyn in 2013. When I was a kid, we always went trick-or-treating on the same Brooklyn block. Starting before sundown, Garden Place transformed from a residential street into an improvised carnival as kids in costumes flooded the roadway. It was a tradition that owed a lot to the civic generosity of the residents, but just as much to design. The houses are attached brownstones, which creates a candy density you could otherwise only find in the brightly lit hallways of an apartment building. Each one has a stoop, which gives candy-dispensing adults a comfortable outside seat that doubles as an elevated vantage point. The stoop also functions as a kind of performative space for the kids; you have to trudge up and present your costume to receive candy. Big windows throw light onto the sidewalk below; twisted branches overhead complete the set. And cars rarely drive down Garden Place anyway, so shutting down traffic on Halloween night is no problem. Garden Place passes with flying colors something called the trick-or-treat test, an architectural metric noticed by planners in Portland, Oregon, almost two decades ago. The idea is simple: Kids, and the parents who chaperone them, have a way of sussing out good urban design. On Halloween, they’ll flock to places where cars drive slowly, streets are well-lit, houses are close together, and front doors are close to the street. If there’s a holiday for city planners, the planner Brent Toderian has argued, Halloween is it. Seven years ago, programmers at Zillow decided to try to quantify this notion with a “Trick or Treat Index.” This October, like every October, their results have been widely shared in the media. And you can see why: How appealing that the best places to trick-or-treat, a bit of knowledge so local that few adults can name more than a couple, could be generated by number-crunching economists! Unfortunately, Zillow’s index—whatever its predictive abilities—makes a hopeless muddle of the trick-or-treat test. It takes an idea about design and makes it about money. The Zillow model combines four equally weighted variables: median home value, housing density, population age, and crime rate. From that, it pulls a list of the 20 best cities for trick-or-treating (whatever) and, more interestingly, a list of the best neighborhoods in those cities. Zillow isn’t wrong that destination trick-or-treating is a thing: Kids go to rich neighborhoods. (See, for example, this unfathomably mean-spirited Dear Prudence letter from 2014.) Big houses equal more candy. That’s fourth-grade Halloween algebra. But by downgrading the importance of urban design, Zillow winds up with some bad results. And although I know I shouldn’t care about Zillow’s Halloween rankings, I do—if only because the real estate listing company is misunderstanding and obscuring a valuable idea about how we build cities. Zillow pick North Dallas, for example, can hardly be categorized as a neighborhood in any meaningful way; hundreds of thousands of people could be said to live there in a city’s range of building styles. The same is true of another selection, Camelback East in Phoenix. As a Phoenician explained to me, saying Camelback East is a good place to trick-or-treat is like saying Brooklyn is a good place to trick-or-treat. It’s a category error. In other cases, the rankings explicitly betray the design concept. In Los Angeles, for example, its fifth-ranked city, Zillow singles out Bel Air and the Hollywood Hills as great trick-or-treating neighborhoods. I am not an L.A. 9-year-old in a pumpkin costume, but I can tell you that neither of those places would pass the trick-or-treat test. Neither neighborhood has a reliable network of sidewalks. Houses lurk deep behind gates, showing only driveways to the street. It was exactly those sorts of houses that produced the original trick-or-treat test (or at least the first mention of it that I can find). In 1999, Portland changed its zoning code to ban what planners there called “snout houses,” or houses whose oversized, street-fronting garage doors resembled the protruding noses of pigs. A small-scale culture war ensued. It turns out this rather simple idea—could a kid find the door and easily get to the next one—is actually a pretty neat way to sum up what constitutes a well-designed neighborhood. It’s an abstract standard, I know. Different people like different things. But find a neighborhood where lots of kids trick-or-treat, and you’ll see how small architectural cues such as lit windows facing the street, parking accessed via back alleys, or slow traffic speeds foster places where people like to walk. Especially in the suburbs. It’s a fun, engaging way to get people to think critically about dry aesthetic issues such as garage frontage and setbacks. Subtle design changes can make houses more oriented toward streets and sidewalks and in turn, make those areas more pleasant places to be. Garages to the back, porches to the front. So the next time you see a neighborhood full of kids trick-or-treating, turn a critical eye on its architecture and zoning. Or if you’re in that minority (hello, fellow travelers) who spend more time arguing over zoning changes than hunting for Reese’s, ask yourself: What would a handful of tiny skeletons think of this street?